Has A Construction Lien Been Filed Against Your Property? 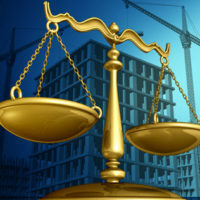 Florida’s construction lien laws provide property owners with relief from a lien on their property in two different ways: 1) The first allows property owners, typically owners of large commercial or condominium properties, to exempt their property from liens by requiring the contractor to post a payment bond prior to project initiation; 2) The second allows owners of real property to transfer a lien to a cash or surety bond after the lien has been recorded under Florida’s transfer bond statute, F.S. §713.24. Under Florida’s construction lien law, any person having an interest in the property upon which a lien has been recorded or a lien foreclosure lawsuit has been filed may transfer a lien off the property to a cash deposit or surety bond by either: 1) Depositing the required amount of money with the clerk’s office; or, 2) Filing a surety bond with the clerk’s office. The intent of the transfer bond is “to permit any owner, whether or not he is in privity with a lienor, to remove the cloud of a lien from his property against which the lien is impressed.” This essentially allows the property owner to proceed with financing, refinancing, or selling of their property, and for properties with construction loans, it releases holds on draws by the bank that are associated with the lien. To speak with an experienced attorney, call Daniel M. Copeland, Attorney at Law, P.A., at 904-482-0616 or submit a contact form.